OLED TV displays projected to hit the $1 billion mark. Displaysupplychain.com has released its Q1 report into the current state of the OLED market. Information contained in these quarterly reports is used to forecast growth and predict trends such as shifts in screen size preferences. The report is the OLED industry’s most comprehensive insight into the state of the OLED market and takes into account fabrication, shipping and revenues across smartphone, mobile (including tablets, smart watches, notebook, monitors and automotive products) and TV OLED panels. 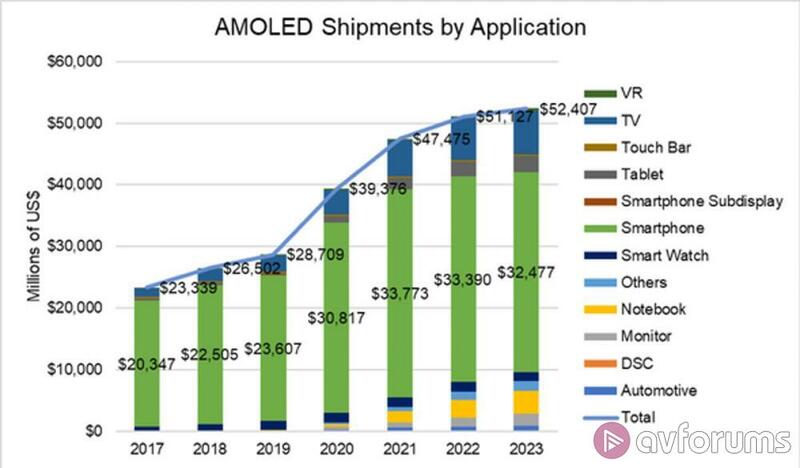 The main expectation is that overall revenues for the OLED market will grow from $28.7 billion in 2019 to $52 billion by 2023. Though the largest application of OLED panels will remain for smartphones, other areas are experiencing growth and TV displays are projected to generate over $1 billion in 2023. In terms of market segments, TV will be roughly equal to smartphone in 2020 (47.6% of all OLED panels vs. 48.0%) but will surpass smartphones in 2021 and increase to 58% of the OLED area by 2023, with smartphone declining to 34%. For sheer unit numbers shipped though, smartphones will continue to dominate. There are now a few more players in the market that are challenging Samsung’s dominant position as the largest global producer of OLED smartphone panels and the South Korean tech giant’s market share in this area will drop from 97% in Q1 2018 to 84% in Q4 2019 in the face of Chinese competition from the likes of BOE Display who are likely to to reach the number 3 position by the end of 2019 due to the strength of sales for Huawei’s flagship P30 and P30 Pro handsets plus the existing P20 lineup. LG are expected to remain between these two companies at number 2 for smartphone screens. 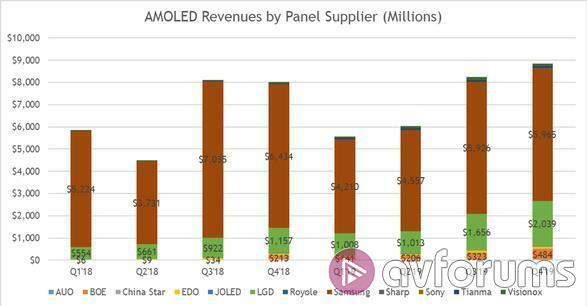 LG Display do however dominate the TV OLED space as the main supplier and this boosts their overall position into second place for overall OLED revenue from 2018-19, behind Samsung. LG Display will have increased TV capacity after the opening of their new fabrication plant in Guangzhou and this is expected to increase their share of revenue to 23% by Q4 2019. LG is the largest client for OLED TV panels and accounted for 59% of the revenues in the TV segment of the OLED market in Q4 2018. Sony increased their TV display purchasing though and accounted for 22% of panel purchases in the same period.